Are you confused with selecting grab cranes? 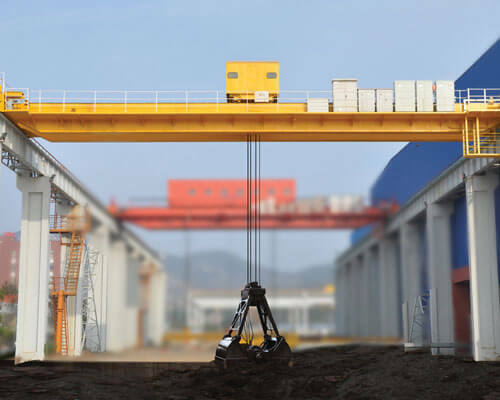 Here in Ellsen, with our dedicated experience in crane manufacturing industry, will provide you some useful information. And recommended some crane products to you, such as the gantry cranes, overhead cranes, mooring winches, electric hoists, etc. 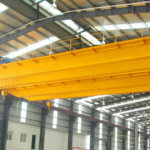 In Ellsen crane manufacturing company, what kind of cranes products and services you can have? Firstly, high-performance crane products with reasonable price. 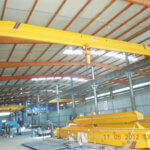 Secondly, systematic services in cranes selecting, purchasing, upgrading, and maintenance, etc. What are the General application fields of the grab bucket crane? 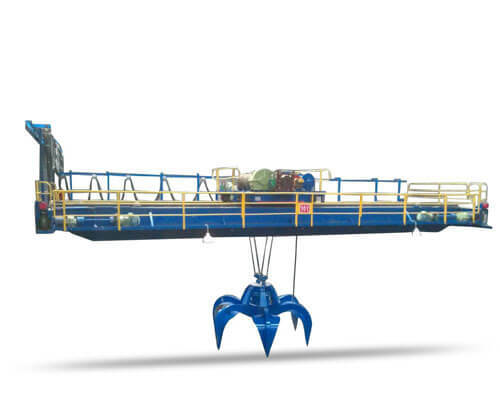 The grab bucket crane is lightweight grab bridge crane supporting the use of grab trolley. And it has two types, one is the general type and the other is hanging type. It’s lifting mechanism is optional electric hoist grab. This kind of crane can be applied in various fields, such as in tunnel, corridor, etc. Grab bucket overhead crane is an important device of the refuse conveyance system in a modern urban refuse incineration power plant. It is mainly used in refuse feeding, handling, stirring, reclaiming and weighting. 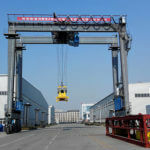 So, a sensible choice for this kind of crane will improve your production capacity and work efficiency to a high degree. Here in Ellsen crane manufacturing company, can be your useful assistant in this kind of crane industry. This series of overhead cranes strictly carry out lifting and conveyance operation, ensure normal running of the refuse incliner-Marion power plant, and it may be manually, semi-automatically or fully automatically controlled. If you have any requirements and needs for this kind of cranes, it is our honor to provide you professional services and dedicated crane products. 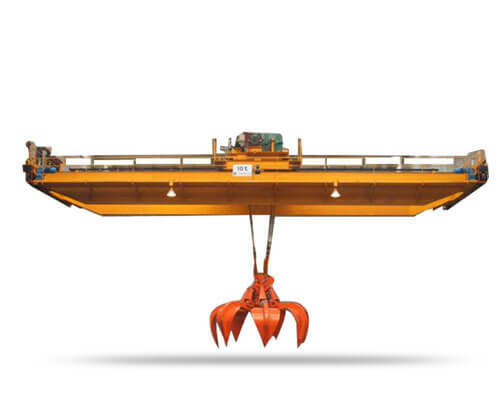 Below we will provide some brief information about the different types of grab cranes for you. 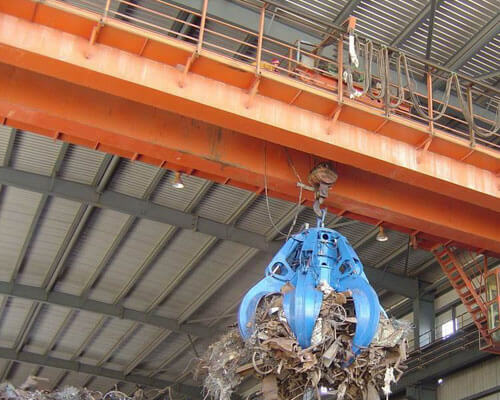 Garbage Grab Crane is the core device of garbage incineration plant feeding system; it mainly responsible for garbage feeding, handling, mixing, extract and weighing. 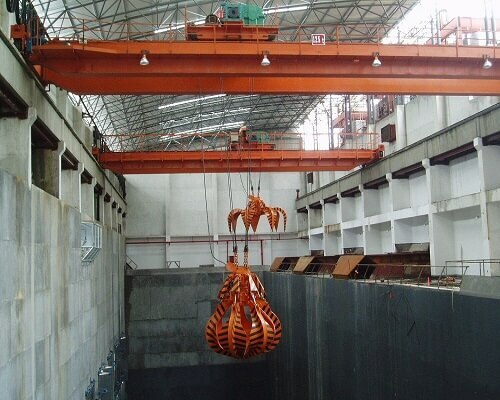 In the field of hydraulic waste grab overhead crane, our company has always been the first-rate level. From the first non-drive transmitting cable drum at the beginning to the four-transducer hydraulic grab overhead crane which to ensure higher accuracy of weight now. At the same time, we never stop researching and innovating so as to keep pace with the most advanced technology. So if you would like any recommends or technical support from our company, we are glad to hear from you. What are the Working processes of the garbage grab crane? Here, the following we will provide you more precise information about the garbage grab crane. Feeding: When incinerator feed port is insufficient of garbage, crane grab fermented garbage in the garbage pit and run to the above of the feed port to feed the filling hopper of the garbage incinerator. Handling: Transported the garbage close to discharge door to the storage pit, avoid congestion of the discharge door, regulating the garbage amount in the pit. Extract: Removed the object of unfavorable incineration. e.g. : Take large garbage out, put it into the crusher for crushing and then feeding, which avoid feeding port congestion. Weighing: For the statistical actual amount of garbage incineration, weighing the garbage before put it into the incinerator feed port. If you would like one grab crane a higher level performance, we would like to recommend to you this one. Because, the overhead crane grab is widely used in loading goods in port, factory, workshop, and power plant. Such a multi-functional grab crane can meet the work requirements. It mainly because that the work classification is heavy. At the same time, the lifting capacity includes the weight of the grab. And this one may be your reasonable choice. 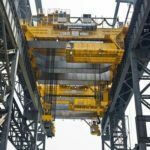 And also the cranes are fitted with a hydraulic and rope grabs to transport material from the storage bunker into the incinerator. Thus, in order to ensure there is a constant flow of material to burn, the incinerator grab crane has a high usage, the company offers high duty ratings, full and semi-automated control system to remove operator fatigue, increase positioning accuracy, productivity, and safety, whilst reducing operating costs. So it will reduce your cost in a certain degree, and increase your work efficiency. Ellsen Company has years’ experience of supplying the above grab bucket cranes across the globe. As manufacturers of Refuse & Waste Grab Cranes, the company also provides solutions for Energy from Waste (EfW) and Recycling Plants. However, to ensure there is a constant flow of material to burn, the incinerator grab crane has a high usage, the company offers high duty ratings, full and semi-automated control system to remove operator fatigue, increase positioning accuracy, productivity, and safety, whilst reducing operating costs. If you have any demands or problems of the above grab cranes, be free to keep us in touch. Right here will provide you most professional services and dedicated cranes. 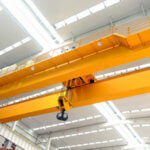 Want to know the grab overhead crane price? All in all, we just recommend to you some basic information and products of grab cranes. Maybe it not specific enough, but we hope it can bring some useful knowledge to help you select your crane products. If you would like to know more, we are also glad to provide you more information. And we also happy to provide our professional crane products and services. Ellsen will provide the low price overhead crane with grap. 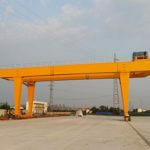 Would like to know the grab double girder overhead crane price? Be free to contact us. One grab 5t bridge cranes, grab four rope reactive structure (double drum), the crane after installation and delivery less than 1 months, found that for the lifting hoist rope has a root in the downward end of the range of serious broken wire phenomenon.After the replacement of the wire rope, the same problem appeared in less than a week.Through careful observation and analysis, it is found that the damage of the wire rope always occurs on the left-hand side of the hoisting drum. In Picture1, the length of the reel is the length of the balance beam, and the length of the grab factory is to prevent rotation. The right side of the drum is on the left side of the reducer, and the left side of the drum is on the left side. The wire rope is used in the structure of 6X19 -, under the wire rope with the resurrection and grab the balance beam with fixed end (not rotating), a steel wire wound on the reel with the rotation of the drum (rising working state) move to the web, at this point in the right side groove (reducer side wire) in the process of moving to intermediate wire rope rope is tight (rotary friction between wire rope and reel), and the left side groove (drum tailstock side) of wire rope to wire rope is intermediate in the process of moving spin looser, and because the balance beam grab rod part too long (300 L larger than the middle drum with the rise of), grab, the angle between the steel wire rope is connected with the grab and wound on the reel of wire rope a growing, wire rope and wire rope winding up on the rolling friction, on the left side of the drum, the wire rope due to a rise in. During the process, a loose and loose wire rope and a wire rope scraped and broken on the drum were broken, and the drum would cause an abnormal noise. For a long time, a lot of broken wires would be produced in the working part of the wire rope, so that the wire rope would be scrapped ahead of schedule. 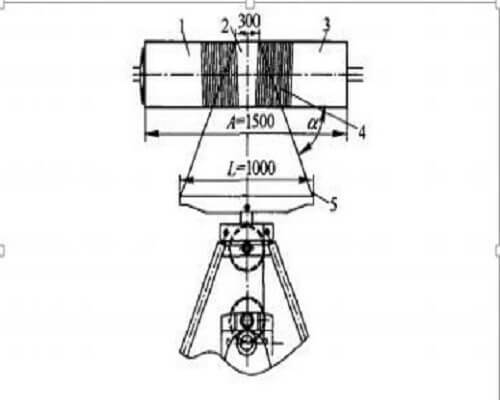 In view of the above problems, it is necessary to improve the reel and grab as shown in Picture 2.The concrete measures are as follows: (1) the pressure rope plate of the reel is moved to the two ends to increase the light rod part (that is, the size) in the middle of the reel. (2) reduce the balance beam (or size) of the grab as far as possible. Through above improvement, ensure grab up to the highest point when the middle part of the rod reel is greater than or equal to the length of the balance beam grab (B = A), can effectively prevent the friction between wire rope and wire rope. Through the improvement, the broken strand of wire rope broken wire has not been used for more than 1 months.The service life of the wire rope is effectively improved. According to the improved experience of this example, in the future design of double drum grab crane, the length of the balance beam of the grab and the length of the intermediate rod of the drum should have a reasonable proportion relationship.It is also possible to use 2 kinds of wire ropes that are consistent with the spiral direction of the reel (1 left revolving, 1 right-handed wire ropes).This can also prevent the wire rope from loosening and breaking the wire during the operation.